Saturday morning dawned and I was stationed at New Threads Quilt shop ready to meet and greet 3 students for the Beginners’ Workshop. The plan was to make a padded Scissors case that has 2 pockets together with a patchwork pin cushion in complimentary fabrics. Maria, Tina and Krystel arrived carrying their machines and fabrics, plus I think a little trepidation about what the day would bring. I hope that by the end of the day they had gained a lot more confidence in sewing and using their machines. We started with an introduction so that I would have a ‘handle’ on just how much experience of sewing they each had and from then on we settled down to make the projects. The padded scissors case is a hack from an original design that featured in Threads magazine many, many years ago. It is a fairly simple project that provides the opportunity to work with fusible wadding, ‘bagging out’ and lots of straight machine stitching. There are a variety of ways that the case closure can be finished – buttons, poppers, velcro. My three students elected to have plastic popper snaps which I applied using the special pliers that accompany the kit. A short break for lunch and then we tackled a more ‘interesting’ project – the pin cushion which features a patchwork block called 3D bow tie/faux cathedral window. 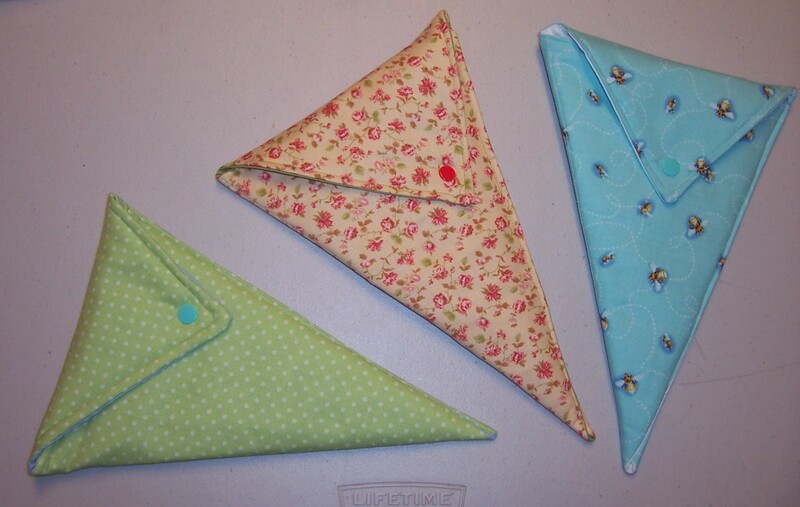 In hindsight this may have been a step too far for a first workshop but ‘the girls’ were game and having made the first block, were determined to ‘crack’ the fabric origami and so made a second block. By the end of the afternoon they had each completed the pincushion complete with polyester toy stuffing and hand (there’s that 4-letter word!) stitched closure. 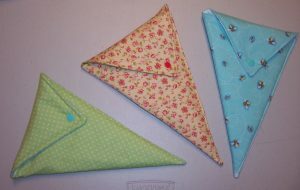 It was lovely to meet 3 such enthusiastic ladies and I hope that they will enrol for other workshops in the future. I am becoming more confident with jersey sewing but my machine continues to misbehave and is inconsistent when it comes to stitching more than one layer of fabric. 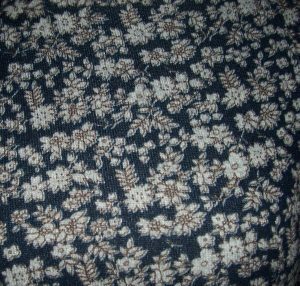 Having resolved the problem of the stretching waistline on the bodice of the Bettina dress I noticed that I still had quite large pieces of the fabric left over. Could I squeeze out another tee top? 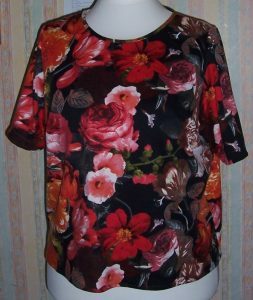 By disregarding placement of the bold pattern I was able to cut a short sleeve tee using my TNT bodice/tee top pattern. 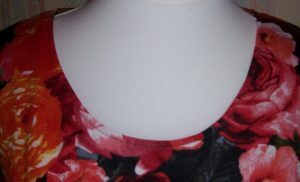 The only differences to the pattern were that I deepened the scoop on the front neckline by approximately 1 inch and reduced the width of both front and back bodice pieces by 1 inch at the side seam hems grading up to nothing just below the bust darts. There was insufficient fabric for the long sleeves and in any case I had long sleeves on the Bettina dress so let’s see how it looks with short sleeves. The top was stitched together very quickly using the overlocker for all seams other than the stay-stitching around the neckline. 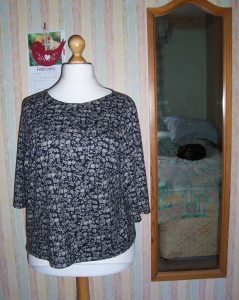 I decided to have another go at binding the neckline. 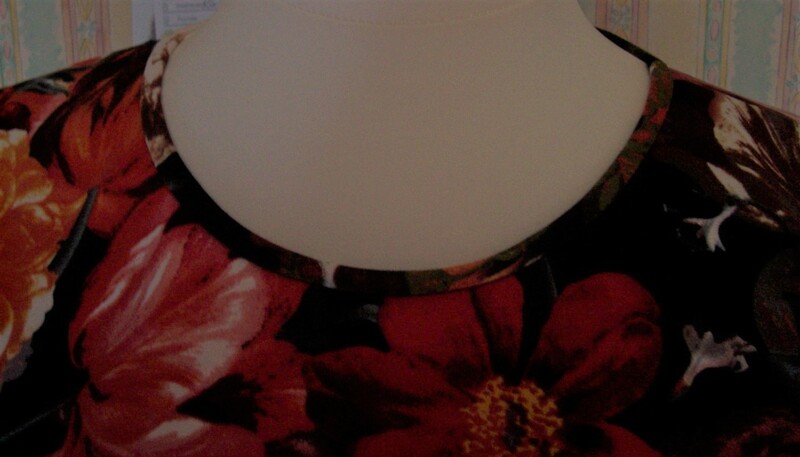 I cut a piece of bias fabric 2½” wide and stretched and pinned to the neckline at the stay stitching. This was then tacked before overlocking. I used the depth of the overlocked seam as a guide to turn the bias to the inside and pinned it in place prior to stitching in the ditch from the right side to secure. I then trimmed the excess bias with pinking shears. It seems to have worked well so next time I will not cut the bias quite so wide and will overlock the raw edge close to the “ditch” stitching. I now have 2 very personalised garments for the cost of just over £20.00 – can’t be bad. My new infatuation with Jersey fabric dressmaking continues but I have now had my first “tiff”with sewing this type of fabric! 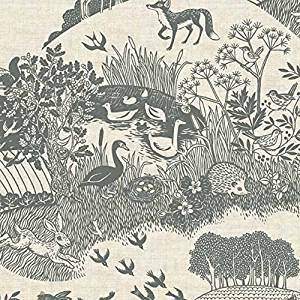 I recently (and contra to my resolution of NOT to buy fabric!) 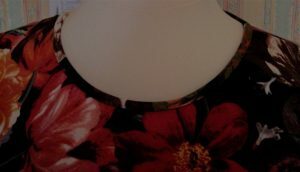 purchased 3 metres at a cost of £5.25 per metre of winter-weight jersey called “Sunset Roses”, a bold floral print from Fabricland. The fabric is great, a nice weight and so soft. 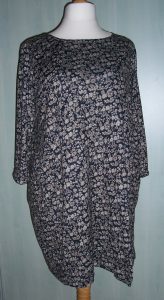 It has a good drape and so I decided to try the “Bettina” that I usually make in cotton or poplin, in a jersey fabric. I did a couple of rows of test stitching but only on single layer of fabric and was dismayed when it came to stitching the darts that there were so many skipped stitches. I changed to yet another brand new jersey needle and re-threaded the machine. Still no joy. In desperation I stitched the bodice darts with the overlocker. No problem. I inserted a length of stabilising ribbon and stitched the shoulder seams. I then stitched the side seams and had my first fitting. Due to the stretch of the jersey, I took in the side seams by ½ inch before inserting the bracelet-length sleeves. Bearing in mind that I have not yet mastered neck binding and bands I cut out a back and front neckline facing using scraps of the jersey fabric. As it was only a single layer, I stay stitched around the neckline and checked my second fit. I tried to stitch the two layers of fabric and lo and behold – great stitching with no missed stitches. Fired up that the problem was now resolved I sewed the panels of the skirt (1 + ½ widths of fabric cut 26 inches long), quartered and stitched 2 rows of gathering to pull up and fit to the waist of the bodice. Although I tacked the skirt to the bodice when it came to machine stitching, the bodice stretched out so now it looked like “Tents R Us!” I had to cut the skirt off the bodice, thereby losing about ½ inch in length from both bodice and skirt and the next time, added some stay tape (made from the selvedge of some spare lining fabric that I had to hand) to the bottom of the bodice to prevent it from stretching out. When I re-attached the skirt to the bodice, this time I arranged the fullness as unpressed pleats. The bodice is no longer stretched out and the fullness was better distributed. Now with a slightly raised waistline and unpressed pleats in the skirt the dress is much more fitted and at last, wearable. Although it does not appear so in the photographs, the front and back hems of the skirt are perfectly level. I had some fabric left over and went on to make a short sleeved tee top more of which is detailed in a separate post. At Monday’s Patchwork & Quilting class based at Franklins, Salisbury we re-visited applique. Emma demonstrated the various ways of applique from needle-turned, raw edge applique and the various methods of machine stitching in place. 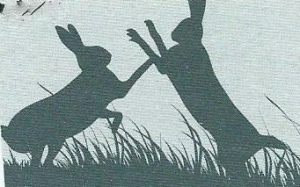 As I have great plans to make a new quilt featuring Mad March Hares, I practised using a “seated hare” applique on the bottom half of a tea towel as supplied by Emma. 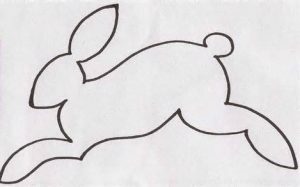 I am now busy researching “Hare” outlines which will be used in random blocks on the quilt. Other blocks may feature flowers that are in bloom in the blustery month – but we shall wait and see what transpires. I may get side-tracked (yet again) and end up making something completely different! After an afternoon of quilting this quilt is now finished! 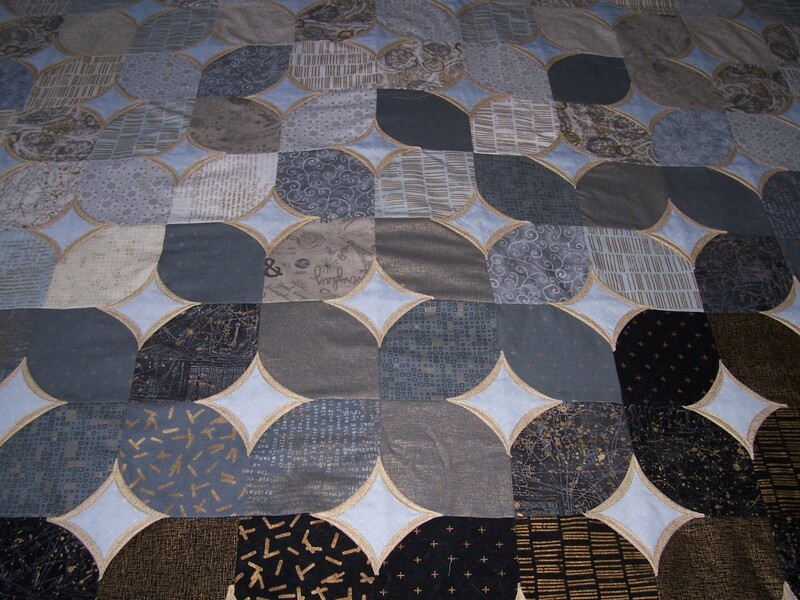 In the end I decided to stick to what I knew and quilted the interlocking circles. I added a binding made from Light Grey Paisley print. This was added by machine and then “stitched in the ditch” so that the entire quilt has been made on the sewing machine. 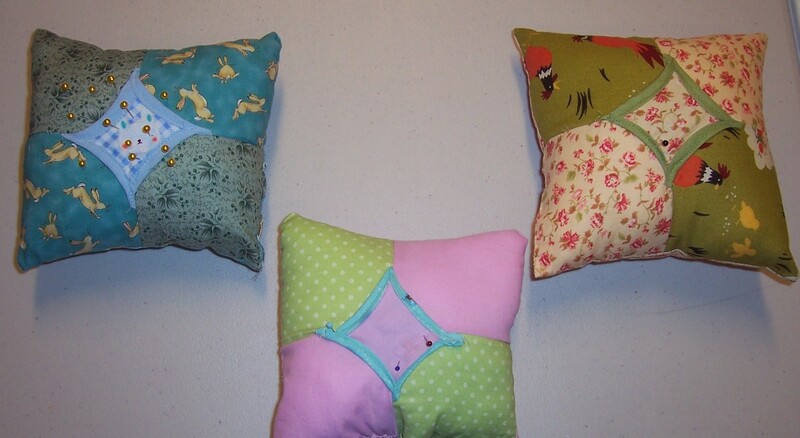 No hand sewing was involved in this project – my kind of sewing! Having completed the “Heather” dress from SEWOVER IT, I had a length of fabric remaining – just enough for another jersey tee. This time I was able to cut the longer length that I required but was still able to have ¾ length sleeves. The tee went together like a dream infact once cut out, it took just 1 hour to stitch together. The bust darts and shoulder seams were stitched on the sewing machine. The shoulder seams were stabilised with short pieces of narrow satin ribbon and then the remainder of the tee was constructed using the overlocker. This time I did not waste any time trying to “finesse” a neck band. I stay-stitched ½ inch from the edge and then turned to the inside before twin-needle stitching in place. 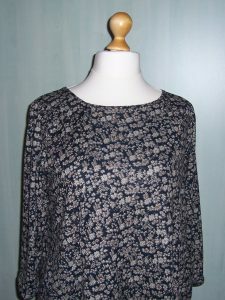 The hems on the sleeves and the body are, as usual, stitched with a jersey twin needle. I still love jersey sewing and jazz just enjoys a nap – you can see her in the reflection of the mirror!! 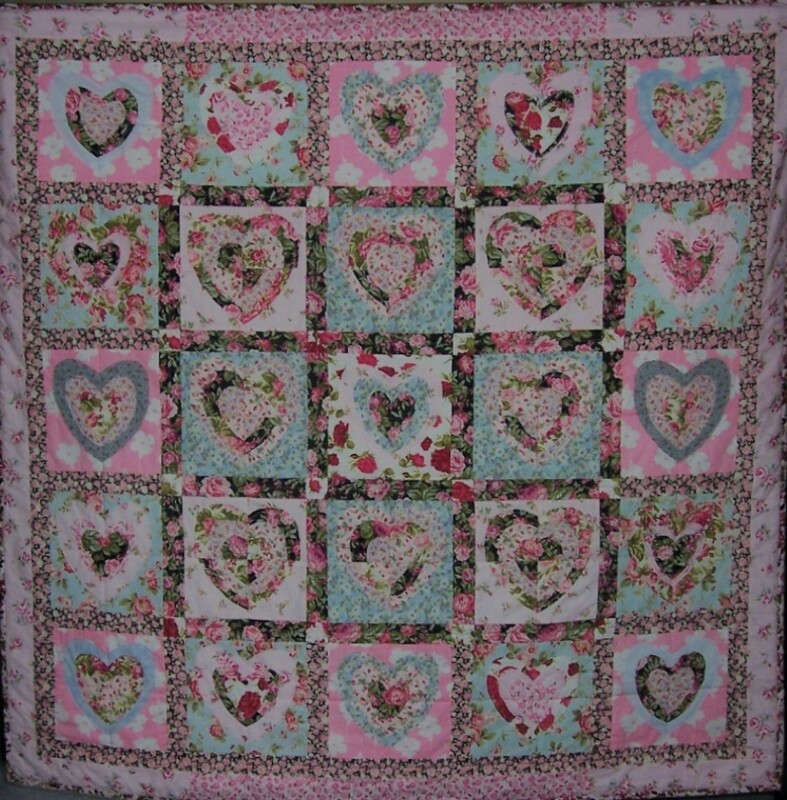 I made this quilt a few years ago and like to ensure that it is on display on February 14th, Saint Valentine’s Day. The quilt originally began as a practice in making layered hearts in raw edge applique but quickly grew into a cushion cover, then a lap quilt and finally a large quilt (60 inches square) for display on the piano. As you can see, each block is made from 3 layered hearts in descending sizes. There are 8 blocks were made then cut into 4 before stitching back together in a random fashion. These were the original blocks and dictated the size of the remaining 16 blocks that surround the centre panel. As each heart applique was stitched I removed the backing so that I ended up with many more hearts than were required. I still have some stored in my stash awaiting another heart-theme project! The quilt has a 2 oz polyester wadding backed with a plain pink polyester cotton bed sheet. 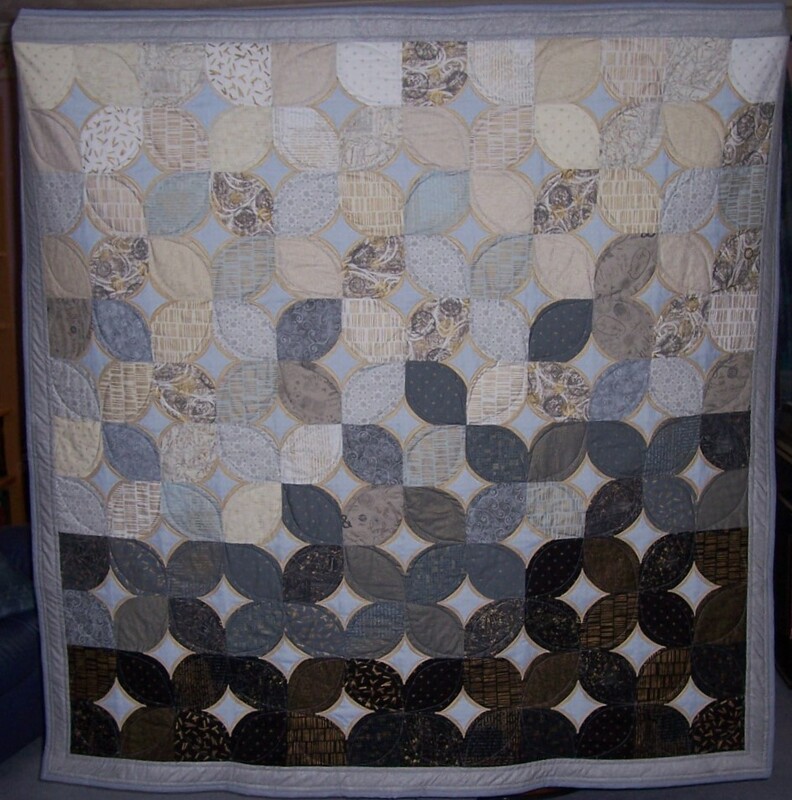 The quilting is minimal – basically the squares and borders stitched “in the ditch”. 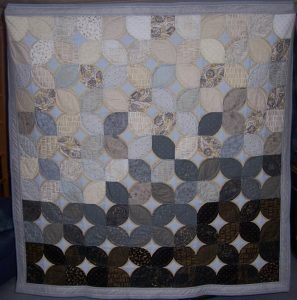 If I were to make this design again, I would increase the amount of quilting but for now it is sufficient. 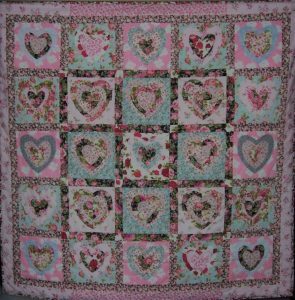 Tomorrow, the 15th February, the Valentine Hearts will be replaced with the “Winter” quilt (I managed to finish on Thursday of last week) – more of which is posted in the 3rd instalment of the project. One of my plans for 2017 is to become more competent when sewing jersey and to this end I have already made a couple of straightforward tee-style tops. I am an avid fan of “Sew Over It” and have recently joined the PDF club. For my free and discounted patterns I chose “Nancy” and “Heather”. The Heather dress is specifically designed for knit fabrics and looked to be fairly easy – armed with 2 metres of 150 cms wide Ditsy floral print jersey in Navy and Grey purchased from Fabricland at £4.59 per metre I set about making the dress. I graded up the pattern at the side seams to accommodate my generous curves. 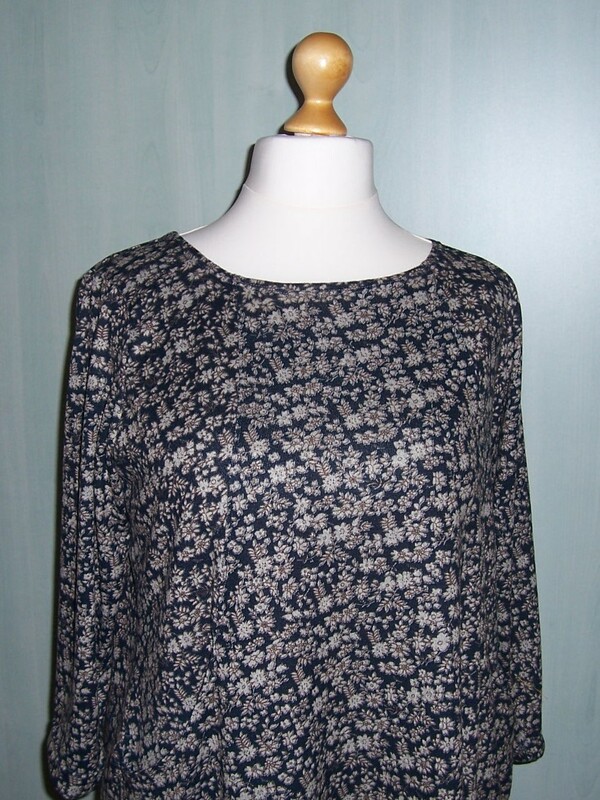 Having read several reviews of the pattern I also increased the width of the sleeves by ½ inch at each side. Within an hour I had cut out the fabric and started stitching it together. I was able to store the partially completed dress on my new dressmaking dummy. 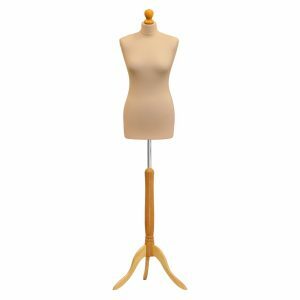 Following the construction information was easy and as I had previously made a woven fabric dress with similar arrangement of pockets in a princess seam, encountered no problems with stitching the pockets. However, the neck banding was much more problematic. Firstly I measured the circumference of the neckline at the seam line and it appeared to be much smaller than the length of the pattern piece. I therefore adopted the formula as detailed in this you tube video. However the band was then too small. I tried again using a slightly longer band and this time it was too big! At this point I abandoned the idea of a neck banding. 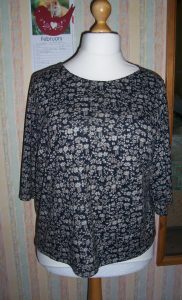 I overlocked the neckline and then turned to the inside on the line of staystitching. I tacked the turning, pressed well and top-stitched in place with the twin needle. 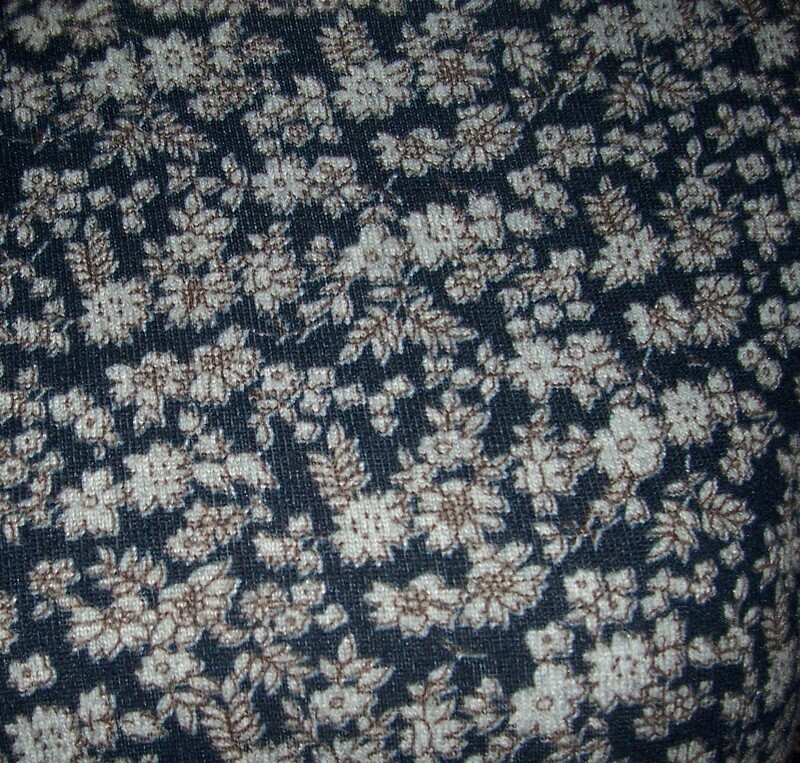 The hems on the sleeves were also finished in this manner. The dress at the neckline, shoulders and bust area in this fabric (which is extremely stretchy) are great. Unfortunately the weight of the pockets tends to drag at the side seams over the hip area and also I think that I need to take in the side seams from the waist to hem at there appears to be too much fabric and no shaping. Again this is probably due to the high stretch qualities of the fabric. It will no doubt be better in a more stable knit. 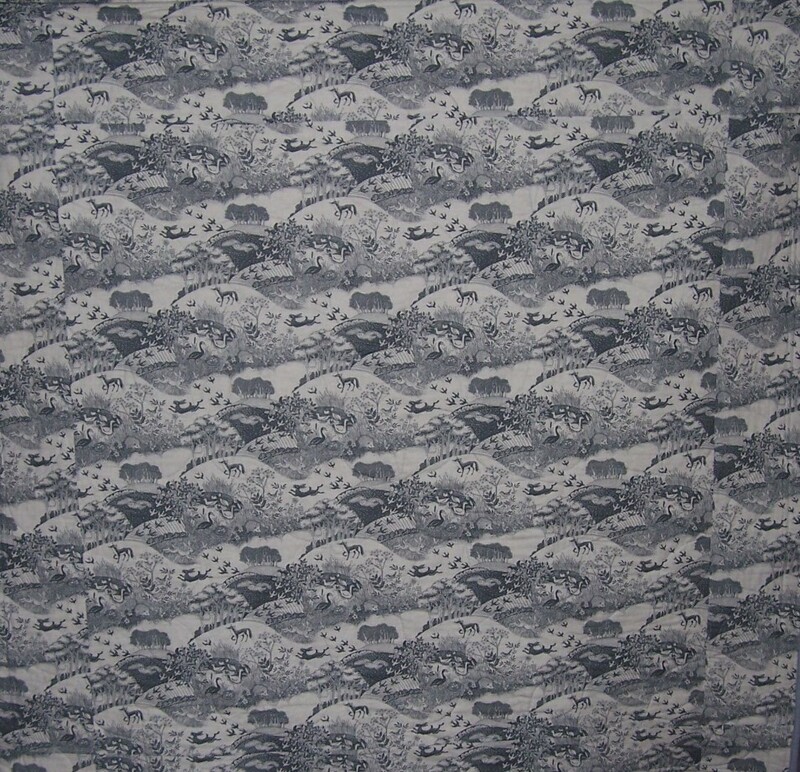 Due to the busyness of the print the details of the seaming is lost. It will be better in a plain or less busy print. Originally I had added 2 inches to the length but at the final fitting I reduced this by 1 inch, turned up 1 inch and then stitched with a wide twin needle. 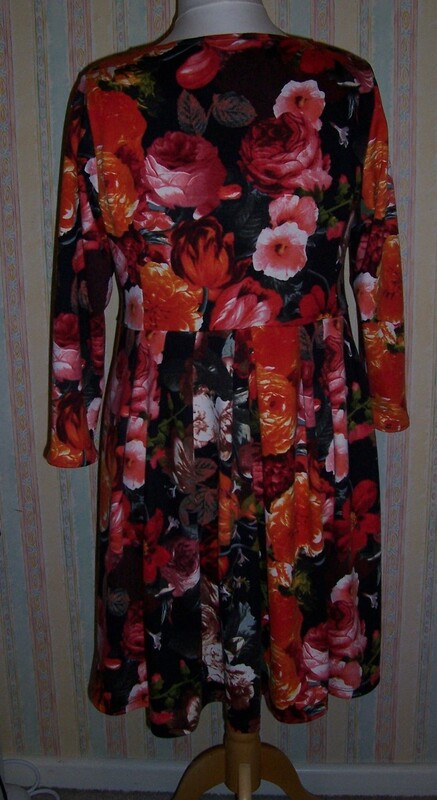 I like the dress and will be making another but this time in a more stable fabric with not so much stretch. I will also be drafting the front panels to exclude the pockets which although are a lovely addition do tend to add “weight” in an area where it is not needed! I am still working on the “Winter” themed quilt but it is progressing well. I have now completed the top and made the “sandwich” of top, wadding (80/20 cotton and polyester from my stash) and backing. Next step is the quilting. Last time I did free-motion interlocking circles and I may well do that again but before I settle to that design I will try some different patterns, possibly using a wide set twin needle. I have been supervised by my cat who seems to think that this quilt is being made especially for her. 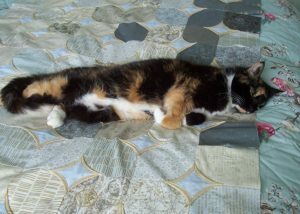 She repeatedly tries to sleep on it when it is laid out on our beds! I had to buy another charm pack of “Luster” as I was running out of sufficient 5 inch squares to make up the 36 blocks that I needed. 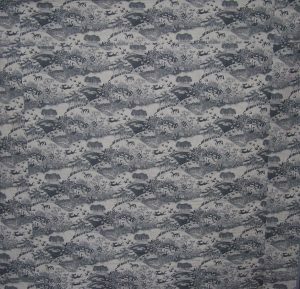 I also purchased some “Burlap” by Benartex in the Silver colourway to make the 2½ inch border that brings the quilt to the required size for covering the grand piano. The backing is made from 1744 Heartwood Scenic © The Henley Studio for Makower UK that I originally intended to make into a dress but on reflection I don’t think the colour would suit me so here it is to ensure that the reverse of the quilt is as interesting as the front. I have decided on the text for the label that will be applied to the quilt once it is completed. It is a Haiku entitled “Winter Forest” by Nick Bagnall. I think this is particularly appropriate as we have a wooded area next to the boundary of our property and there are many leaves falling into the garden. We also have our own hedgehog that makes regular visits during the Summer and is currently hibernating behind the garage.